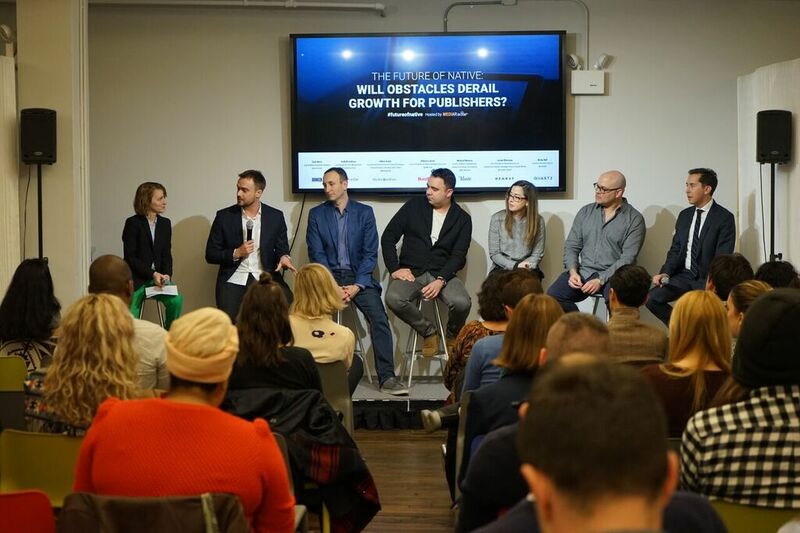 At a recent event hosted by MediaRadar, panelists shared their opinions about the future of native advertising. Photo by Tori Kurtz for MediaRadar. Three months later, the Times jumped into the fray. Today the company boasts a fully-fledged content marketing arm, T Brand Studio. Adam Aston, vice president and executive editorial director of the Studio, said when it was first launched, there was a sense of anxiety among the Times’ newsroom, as well as advertisers, that the content they created wouldn’t be up to par with its editorial content. All of the publishers represented by the panelists have separate staff creating the advertising content, rather than using journalists and producers from the editorial teams. However, the native advertisements are greatly influenced by the editorial side. Rebecca Scott, BuzzFeed’s Vice President of Brand Strategy, speaks during the panel event. Photo by Tori Kurtz for MediaRadar. BuzzFeed sees native advertising as “something that fits in naturally and authentically to wherever someone is consuming content,” according to Rebecca Scott, the website’s vice president of brand strategy. Ideally, native advertising should fit in seamlessly with the editorial content a publisher is already creating – and it should not disrupt the user’s experience. And it should be additive, compelling and authentic, rather than just be a commercial, according to Jason Kleinman, the vice president of brand solutions and global ad products strategy for Hearst. Michael Monroe, the Atlantic vice president of marketing who leads the company’s own in-house content studio, said one of the reasons its readers have engaged with native advertising is because it is of a high quality. Kleinman said for Hearst, the goal is to find the sweet spot between what Hearst’s readers want and what embodies the tone and ethos of its brands, as well as meets the objectives of its advertisers. “That’s where we see the rubber meeting the road,” he said. Cartier Presents: A Voyage Through Time from T Brand Studio on Vimeo. The only thing readers of the Atlantic don’t like about sponsored content, Monroe said, is being in the dark. He said the Atlantic not only identifies that something is paid content, but also gets specific about the source – including who wrote it, has it been published elsewhere, and whether it was created in-house. Not only is transparency the right thing to do, but if you want both readers and advertisers to return, it’s your only option, he said. It’s critical to follow those “rules” in order to have a sustainable long-term business, he said. Also note that readers of different demographics will respond to sponsored content differently. Younger readers are more relaxed – almost ambivalent – toward the container that something comes in, Aston said. Meanwhile, older readers are rooted in the “‘older world’ where that line between church and state line of advertisers influence is really powerful in their minds,” he said. But if the content is good enough, older audience members will still appreciate it. She said BuzzFeed analyzes its editorial content – 600 pieces published per day – to see what sticks with readers. Then, depending on what the advertiser’s goals are, the marketing team can make strong recommendations. BuzzFeed measures engagement in real time and then makes adjustments from there. Todd Krizelman, the co-founder and CEO of MediaRadar said long campaigns tend to perform the best – and encourage the most returning advertisers – because they give publishers time to keep tweaking the campaigns until they’re most effective.